When we stayed with Bruce and Annette on our recent Australian trip, Annette made gnocchi. Her family is of Italian origin and were winemakers. Every year they buy a pig and have a great family get together to make salami and other cured meats. Bruce, who is a chef, but not Italian, has reached the stage of being responsible for getting all the meat off the pig's head. I'm not sure if that's a compliment or not, and I don't think he is either. Anyway, back to gnocchi. I took lots of photos to show how Annette did it, and just recently at home I tried to replicate it. 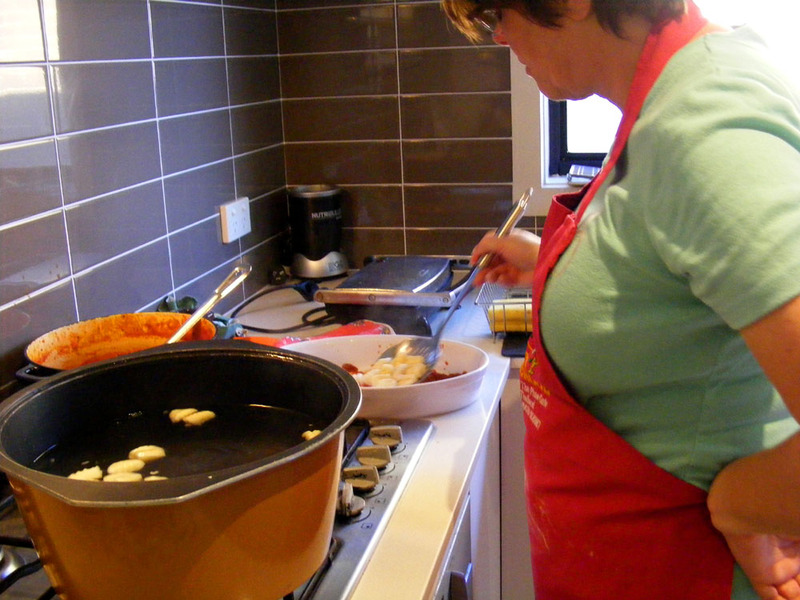 Annette carefully chose potatoes that were the same size and boiled them whole until they were cooked through and soft. 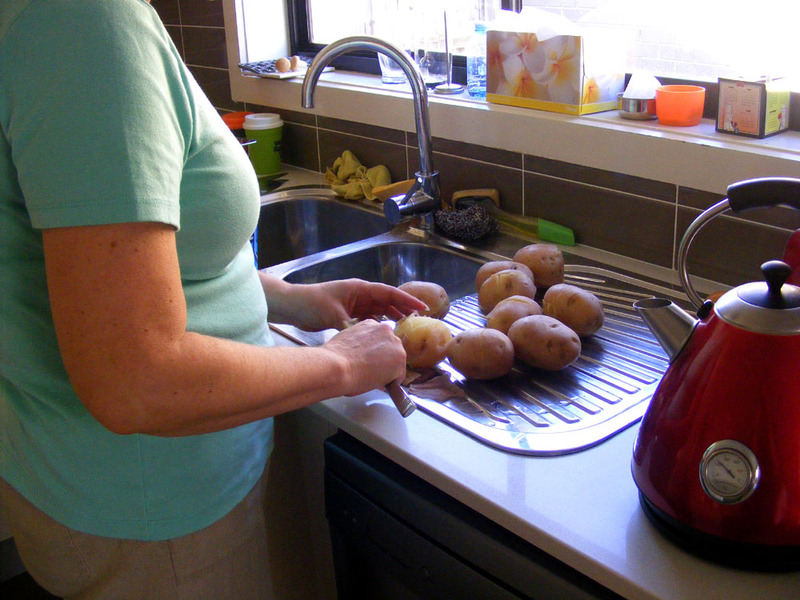 While the potatoes were still warm she slipped the skins off. 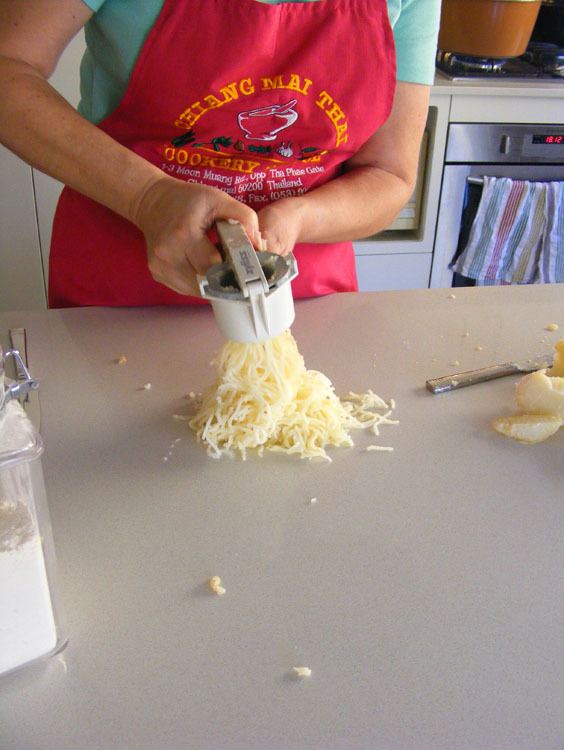 Putting the potatoes through a ricer. Then she put the potatoes through a ricer, making a pile of potato directly on to the bench. I think that helps keep a light and fluffy texture which you would lose if you use a masher. A well was made in the centre of the potato and an egg carefully mixed in. 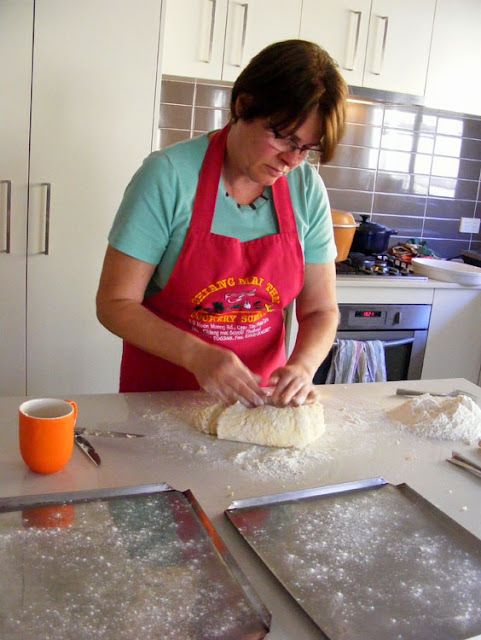 Then flour was added to make a consistency that Annette felt was right. It was all done by eye and feel, no measurements. She struggled a bit with making such a small quantity. 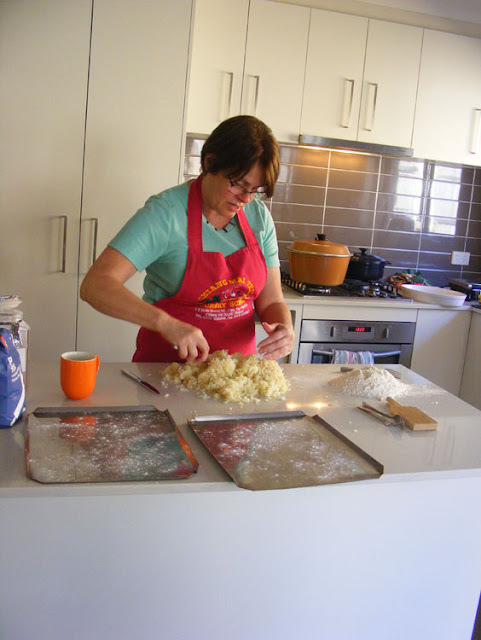 She was only feeding four and she's much more used to making gnocchi for the whole extended family. 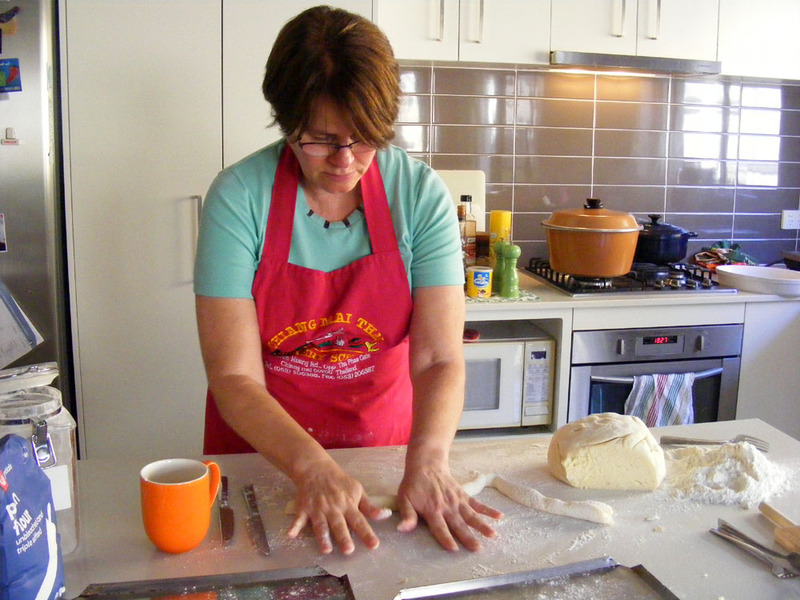 Bits of dough are sliced off and rolled into sausage shapes which are then cut into pieces a couple of centimetres long. 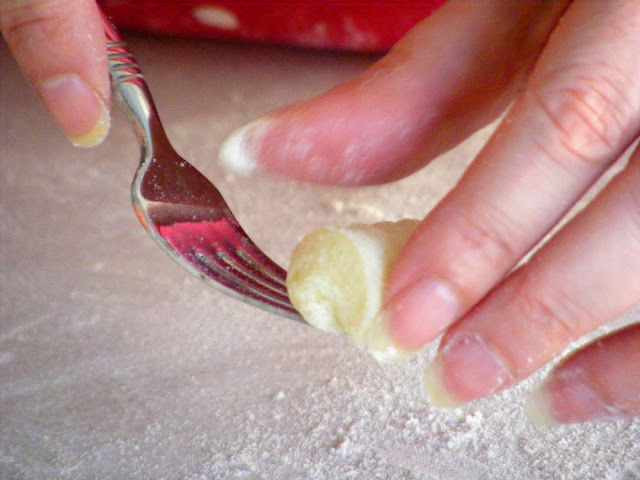 The little morcels of dough are formed into gnocchi dumplings using a fork. They are gently pressed to make an imprint of the tines which creates ridges, then the piece of dough is rolled off the fork to end up as a sort of pillow shape. The dough made three trays like this of gnocchi. 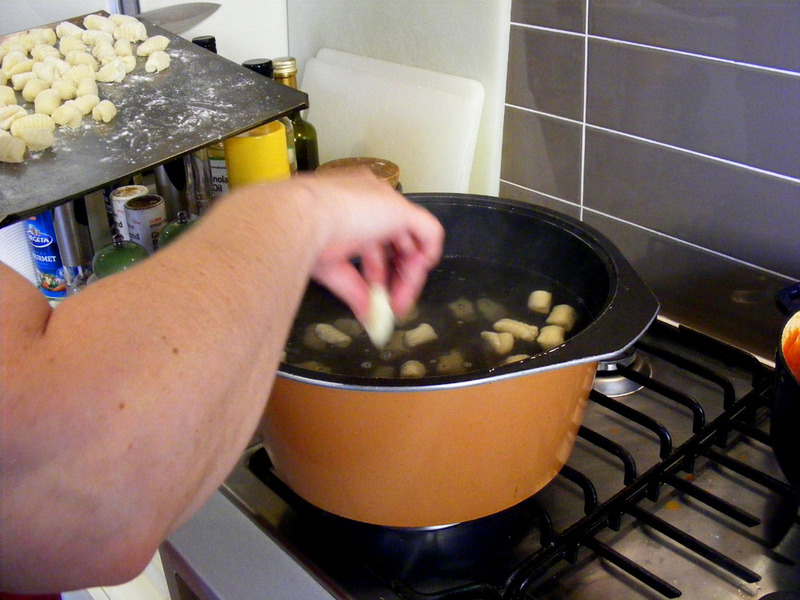 The gnocchi are dropped into boiling water in batches of about 30. They sink and you know they are done when they float to the surface. The ones I did at home took about 4 minutes. 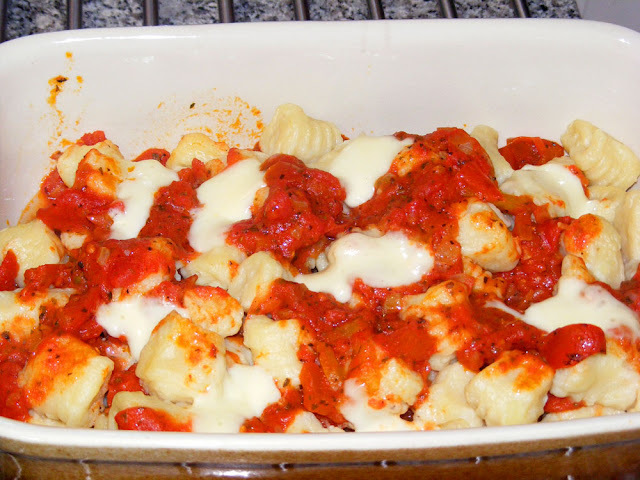 The gnocchi are scooped out of the boiling water with a slotted spoon and put in a gratin dish, alternating with a bit of tomato sauce. Annette served hers immediately, I put some mozzarella on top and baked mine for 10 minutes before serving. My gnocchi and tomato sauce. I failed to photograph Annette's final dish, but here is mine from several months later. My forking skills got the thumbs up from Annette on FB when I posted this photo. I love gnocchi. It falls into that category of deceptively plain starchy foods that come very high up my list of best foods ever. Just like you, Susan I love gnocchi. Unfortunately, it's so long ago, I can't remember the last time I had some! The process seems to be very time consuming, or is it just me? Once you get into the swing of it, it's not as time consuming as you might think. Is there a variety of potatoe that does the recipe proud? Plus I've meant to get a ricer for quite a while now. My understanding is that it is more important to use the smallest possible proportion of flour than worry too much about what variety of potato you've got. I think that mealier (plus farineuses) potatoes like Bintje or Agata would be better for gnocchi than waxier potatoes like Roseval or Gourmandines. Same would be true of making mashed potatoes (purée). I would have thought floury potatoes were better too, but apparently waxy ones are very often used in Italy. Anyway, in Australia potatoes are rarely labelled for variety or end use, just colour (very helpful?!) and size or where they've come from sometimes (as in which region of Australia). My memory of potatoes in Australia is that they are mostly floury. I'd never encountered the idea of using different potatoes for different things and having potatoes labelled for variety or function in the supermarket until we moved to England. 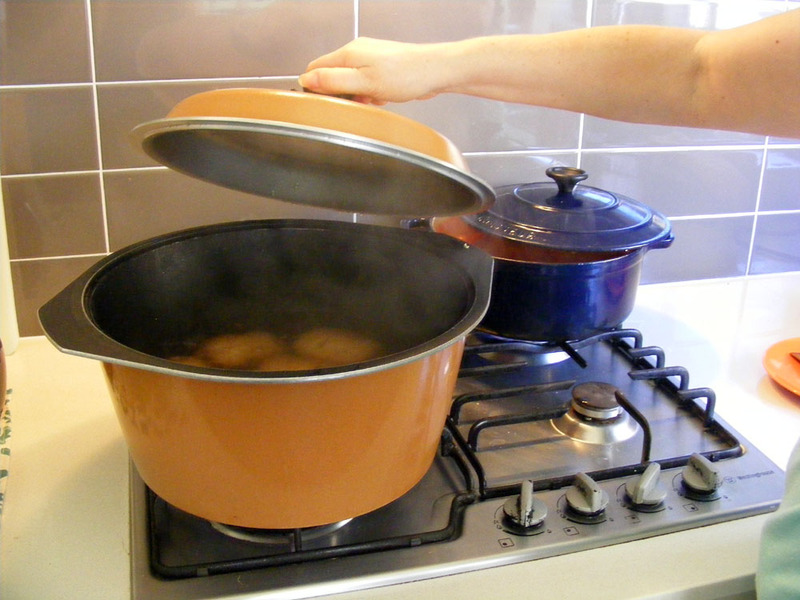 In the U.S., mainly you see the terms "baking potato" or "boiling potato" and sometimes a varietal name, like "Idaho" or "russet" or "Yukon gold" for example. I don't know about Italy. 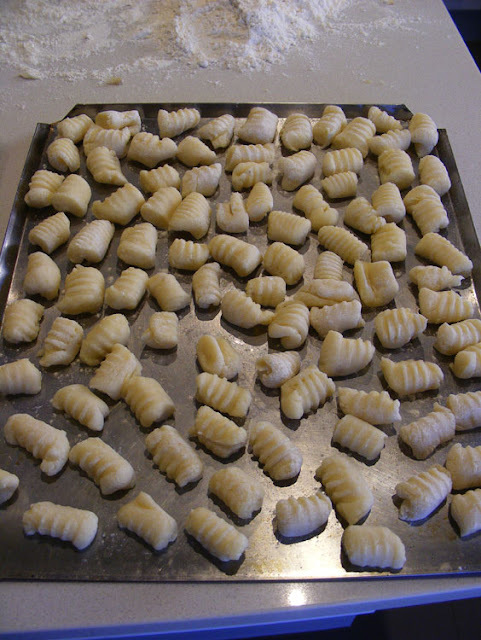 The Wikipedia article in English say gnocchi should be made with "starchy" potatoes, which I take to mean the opposite of "waxy." I see a post on my blog where I made gnocchi using pureed acorn starch flesh, which is not all that starchy.